Spa Manicure - Sensual Peppery Rose Gift for your hands….. Although the hands are the ultimate focus of our Spa Manicure Line, the real gift is the sensory experience the Spa Manicure Sensual Peppery Rose offers. Although the hands are the ultimate focus of our Spa Manicure Line, the real gift is the sensory experience the Spa Manicure Sensual Peppery Rose offers. Smell – Sensual Peppery Rose is the ultimate contradiction in fragrances. It’s rose, but not traditional rose. That is the magic of pink pepper. It doesn’t smell spicy, but provides a contemporary rose note. Pink pepper is a key ingredient in a wide range of high end perfumes on the market currently, making it so sought after, so familiar. Touch – Each and every product has been created to stimulate your fingertips. Soothing soaks, invigorating scrubs, luxurious lotions. Sight – The product range was created with high quality natural ingredients in mind: no colorants, just pure, natural ingredients. 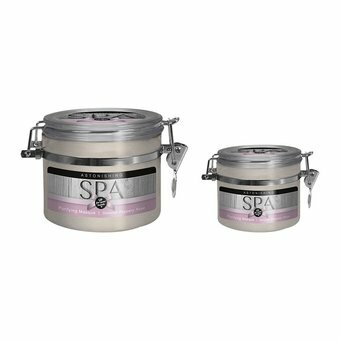 The Spa Manicure Sensual Peppery Rose is more than just a great smell, it has been developed with the ingredient conscious consumer in mind. We want to offer you a product that not only looks good, but one that helps you look even better. Break away from your daily routine and busy schedule. Find a moment to relax. A moment to nourish the body and nurture the soul. Enrich your life with our gift to you. Astonishing Spa is all about taking you back to the basics where nature is the key ingredient. Inspired by rich traditions and sacred knowledge passed down through the ages, Astonishing Spa encourages you to rediscover the true gifts that nature has to offer. Astonishing Spa has made a selection of nature’s purest offerings. These natural, active ingredients combined with nourishing essentials have been tried and tested through the generations. Together with innovative technology, the result is a product line that does what it promises.